Upon receiving a commission from the Philadelphia Chamber Music Society for a violin and piano piece in honor of its 30th anniversary, my plan was to write a sonata, a term suggesting a relatively abstract discourse. But as the piece developed, the movements struck me as character pieces rather than music employing a more “symphonic” approach. When specific poems started to attach themselves in my mind with two of the movements, the overall title Five Poems became clear. The title of the second movement is a line from Susan Stewart’s “Descent”, which deals with Aeneas’s visit to the underworld. The music is alternately fiercely driving and quite still, though tense. Robert Frost’s “Nothing Gold Can Stay” summons fleet scale passages framing lyrical counterpoint. The remaining movements do not refer to specific poems, but have titles reflecting their expressive tone. “Dreamscape” is musing with an improvisatory violin line over shifting pairs of piano chords. “Nightsong” is a bluesy lullaby that turns highly dramatic. “Vision” begins with a closely argued struggle but breaks through to something spacious and clear. I greatly enjoyed the other premiere on the program, Transparência, composed by Jeff Scott, hornist with the Imani Winds. The piece is a sonata inspired by scenes from Brazil, and alternates dance rhythms and moody lyricism. Tai and Ieva were elegant in Beethoven’s Op. 12, Nr. 2, and also offered the enigmatic Janáček sonata, plus two sweet and brilliant Viennese pastries in the form of short works by Korngold. Here’s a shot with Jeff, Tai and I – sorry I didn’t get a picture with Ieva! There has been a change to the date of the premiere for my Five Poems for violin and piano. Instead of February 3, the performance, presented by the Philadelphia Chamber Music Society, will be May 9, 2016, at 8 pm. The venue remains the American Philosophical Society here in Philadelphia. 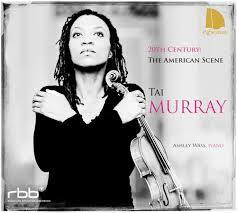 The violinist will be Tai Murray, with pianist Gilles Vonsattel. It’s an intriguing program, featuring another new work, this one by Jeffrey Scott, called Transparencia. Jeff is best known as a member of the outstanding Imani Winds. Both Jeff’s piece and mine were commissioned by the Philadelphia Chamber Music Society in honor of the Society’s 30th anniversary. There will also be a Beethoven sonata and some infrequently played works by Korngold and Janacek.